"Marinated pork chops are grilled to perfection and topped with a spicy salsa starring pineapple, mango, and applesauce." 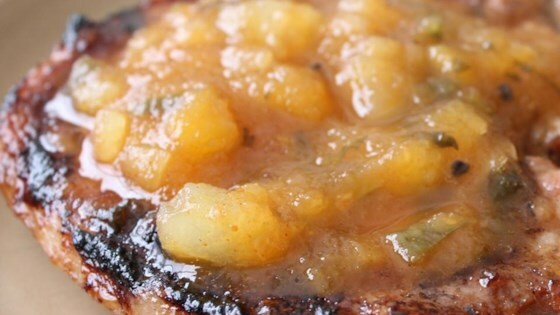 Grilled marinated pork chops are topped with a spicy pineapple-mango salsa. OUTSTANDING flavor! I've used chicken also with great success. I used coriander for the cardamom seeds and had to resort to frozen chunked mango but all was still great. I love this recipe! !